To celebrate his new self-released LP Funeral Mutes, Francis Plagne will perform in the homely surrounds of Eastmint Studios, Northcote on Saturday the 9th of January, accompanied by Ben Bourke on bass, Alex Garsden on guitar, James Rushford on keyboard and Joe Talia on drums. 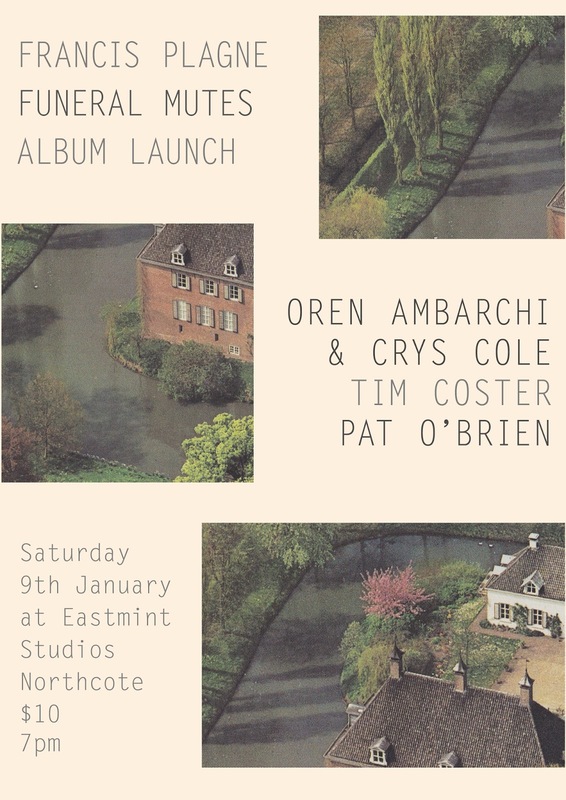 Also on the bill: a rare Australian duo performance by Oren Ambarchi and Crys Cole; textural keyboard hermit Tim Coster; and Mad Nanna string squeezer Pat O'Brien. Antony Riddell will perform and read from his various writings with musical accompaniment from Rosalind Hall, Francis Plagne, Samaan Fieck, Dave Brown and Christopher LG Hill. Liquid Architecture presents Fingerprints on the Surface of the Brain, the first ever solo exhibition by the artist, writer and musician Antony Riddell. Originally from Adelaide, Riddell moved to Sydney in the early 1980s where he connected with a lively underground scene of artists, punks and other experimenters. His early band Nada shared stages with the likes of The Laughing Clowns, The Triffids, Jon Rose, Fetus Productions, God Meat God, Carnival Headgash, Browning Mummery and more. Then, in 1985 Riddell suffered a life-altering accident. Falling through the roof of a Redfern squat, he sustained serious brain injuries that would permanently affect his balance, speech and movement. Riddell’s remarkable artistic works since that moment bear the mark of, and also self-consciously confront, what he has called the “fingerprints on the surface of the brain”. Following studies at the Sydney College of the Arts in the late 1980s, making ‘monstrous’ sculptures in clay and concrete, Riddell moved on to Melbourne. In 1991 he formed the group Volvox, with Dave Taskas of legendary punks Grong Grong and noise artist Glenn Normann. Operating as the project’s frontman (under the pseudonym Lester Vat), Riddell delivered extraordinary and profoundly influential performances — his aggressive physical impropriety and neurologically-disordered vocals sat alongside other lyrical interventions, simultaneously absurd, yet strangely elegant. Despite never playing outside Melbourne, Volvox made a lasting impression in Australia and beyond. Musician and ‘What Is Music?’ founder Oren Ambarchi characterised the band as “outside of everything” while Bananafish’s Tom Smith judged them “worth the lives of ten thousand Cobains”. Beyond musical performance, Riddell developed a prodigious writing and drawing practice, which he continued following Volvox’s dissolution in the mid-1990s, generating countless artist books, many published on his own imprint Meniscus. His texts — typically hand-drafted in miniscule barely-legible cursive script, and later transcribed to computer — narrate uncanny and irrational stories marked by surrealist wordplay. Riddell’s illustrations manifest as fine line-drawings and cartoons using felt-tip pen on art paper, and typically depict anthropomorphised organisms, animals and brains in various states of relation.